WASHINGTON — Just after midnight last Christmas, Pakistani officials say, two Hellfire missiles from a U.S. drone slammed into a house in Miramshah, Pakistan, killing four militants. It was an otherwise unremarkable episode in the sixth year of a relentless unmanned aerial campaign by the CIA. Unremarkable, except for this: There hasn’t been a drone strike reported in Pakistan in the months since. The secret targeted killing program that once was the mainstay of President Barack Obama’s counterterrorism effort appears to be winding down. In a major foreign policy speech at the U.S. Military Academy on Wednesday, Obama said the U.S. would continue to carry out occasional drone strikes, but he cited Yemen and Somalia, not Pakistan, where drone missiles once rained down at a rate of two per week. Armed U.S. drones are still flying regularly over Pakistan’s tribal areas, and CIA targeting officers are still nominating militants to a kill list, according to U.S. officials regularly briefed on the covert program who spoke on condition of anonymity because they weren’t authorized to discuss covert programs publicly. But over the past five months, no missiles have been fired. And while the CIA won’t say the program has ended, Obama announced this week a plan to pull nearly all American troops out of Afghanistan by the end of 2016. The targeted killing program in Pakistan relies on drones flown from, and intelligence gathered in, U.S. bases in Afghanistan that would then be closed. Several factors are driving the change, U.S. officials say. Many of the senior al-Qaida figures in Pakistan have been killed. Those who remain are much harder to target because they are avoiding mobile phones and traveling with children, benefiting from stricter targeting rules designed to prevent civilian casualties. The drawdown of U.S. troops from Afghanistan has eliminated the need for “force protection” strikes against large gatherings of militants in Pakistan suspected of plotting attacks against American troops. For as long as they are able to fly over Pakistan, CIA drones will hunt for senior al-Qaida figures, including Ayman al-Zawahiri, al-Qaida’s leader, U.S. officials say. If the agency gets a clean shot at such a target next week or next year, it will push the button, they say. “By the end of this year, we will have a noticeable degradation in our ability to collect intelligence on people of concern,” said Rep. Mike Rogers, R-Mich., the chairman of the House Intelligence Committee. The current drone cease-fire in Pakistan is by far the longest pause since President George W. Bush ordered a stepped-up campaign of targeted strikes in that country’s tribal area in the summer of 2008. The pace intensified under Obama. All told, there have been 354 strikes in Pakistan since 2004, according to the Long War Journal, an online publication that tracks the strikes through media reports. In December, the Obama administration reached an informal deal with Pakistan that the CIA would suspend drone strikes — except against the most senior al-Qaida leaders — while the government of Prime Minister Nawaz Sharif pursues peace talks with the Taliban. The talks have sputtered, and last week Pakistani fighter jets killed more than 60 people in North Waziristan, a militant stronghold, according to local media reports. 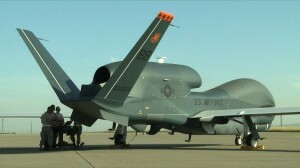 Left: PBS NewsHour video still of U.S. Air Force drone.